Apple has added a bunch of new features inside of watchOS 5, including things like wind direction in weather and memories in Photo face. If you own a recent edition Apple Watch you have lots to look forward to when Apple ships watchOS 5 this fall, as it introduces a large series of feature enhancements that will make even an existing unit much better to use. The biggest new fitness features in watchOS 5 are activity competitions and auto-workout. The release also features new Yoga and Hiking fitness modes, while running mode provides a personalised pace alert, tracks cadence, and offers comparative data. Activity competitions lets you enter a 7-day competition with a chum, jut tap Compete and enter their name. Each person earns points by filling their Move, Exercise, and Stand rings. 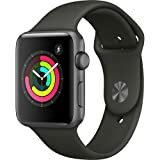 The winner gains an Apple Watch award icon, while both participants can send each other messages during the challenge and the watch will pester you when you begin falling behind. Start a competition from inside the Activity app, just tap Sharing, + and then select the contact(s). Choose Send and wait for the invitation to be accepted. Auto-workout is pretty straightforward: The watch monitors your heart rate to see when you’ve begun a workout,and will offer to stop the workout once you reach a measured goal or a higher heart rate. Automatic workout detection works with Outdoor Run, Indoor Run, Outdoor Walk, Indoor Walk, Elliptical, Rower, Pool Swim, and Open Water Swim. The new watch OS boats a Podcasts app which means you’ll be able to hear all the latest episodes from your watch. (Really good if you’re out for a walk with only your watch and wireless headphones). Once you pair your headphones you can ask Siri to open the podcasts app, which will automatically open your most recent podcast. You access different controls using the digital crown, which will let you browse episodes and seek out different ones. You can even subscribe to new shows using Siri and your watch, and podcasts that are listed in the episodes section are downloaded to the device. watchOS 5 introduces WebKit support, which means you can click and open web links in apps like Messages. It’s not a browser, but lets you stay on top of messages without opening your iPhone. How it works: When you receive a message containing a web link you can click on it to open the page in a mini webpage. What’s great is that all the links in the page are also active, so you can click them. Digital Crown scrolls up and down the page, while double tap activates zoom and a long press activates back, forward and other options. Tip: Send yourself an iMessage with a link to DuckDuckGo and you can use that message to search the internet from your wrist. Only Watch Series 3 or later support this feature. Apple’s Walkie-Talkie mode lets you add friends to your small selection. Once you do you can contact them in high-quality audio by touching the Walkie-Talkie button and selecting their name. This solution uses both cellular and WI-Fi networks, but requires that your friends consent to being one of your Walkie-Talkie contacts – and also requires that they own and use an Apple Watch. The Siri watch face is far smarter. Not only will it suggest more information to you, but it can also figure out what it thinks you are doing and provide you with what it sees as relevant information to help you do more. Additional information includes heart rate data, sports, health and travel time information, as well as Siri Shortcuts. The latter is a smart AI solution that aims to help you get things done by providing you with app-based shortcuts and information designed to help you meet your goals. Within this, Notifications you receive on your Apple Watch are now actionable. Another Siri improvement? We won’t need to say “Hey Siri”, as Siri will activate when you raise your wrist – you enable this behaviour in Settings>General>Siriand toggle ‘Raise to Speak’ on. When you tap Do Not Disturb you can now choose to leave it on for a set period of time, an hour, or until you leave a location. You can access Wi-Fi in the Settings app, here you can also choose which network you want to use. There are numerous additional improvements, including an editable Control Center and a critical alerts system. watchOS 5 will be available this fall. The battery life is terrible. My Apple Watch day starts with charging in the morning (about an hour). I wear it that day, checking time occasionally and workout tracking. At night, I use the sleep app, so I wear it all night. At times, though, I forget to charge it in the morning, and by noon it dies. Longer battery life would be better. There is, after all, exciting competition in the Watch space and price point.